Snow Set To Sock New England Yet Again : The Two-Way As much as 2 feet of snow is expected in Maine, and some 3,000 flights nationwide have already been canceled. The approach of the big storm follows on the heels of a winter blast just days ago. 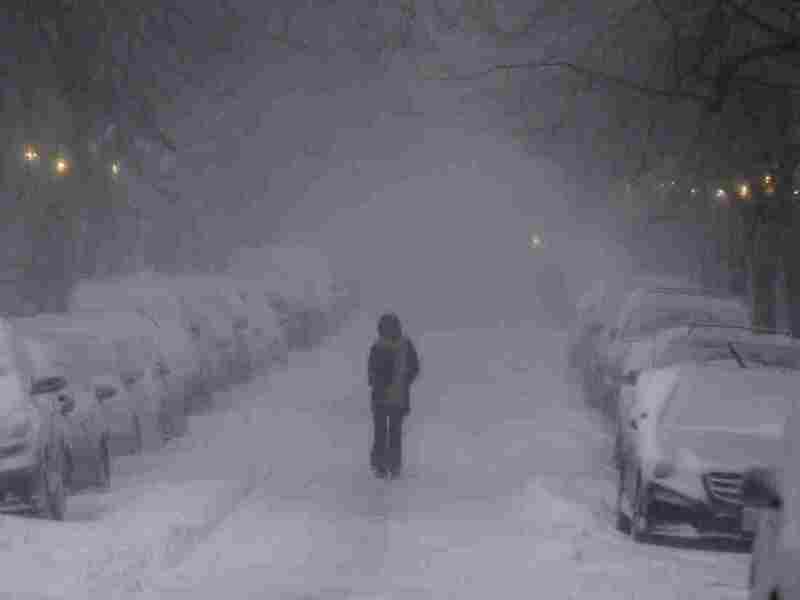 A woman walks in whiteout conditions in Boston on Thursday. Sunday's forecast promises similarly daunting conditions, as a winter storm bears down on the Northeast. If it seems like it was just yesterday the Northeast had to batten down for a big, blustery snowstorm — well, you're almost right. The shovels are hardly dry from the foot of snow dumped on New York City and Boston late last week. But, to take some liberty with an old adage, no rest for the wintry. Snow has already returned to the Northeast, and meteorologists expect that well into Monday, areas from upstate New York to Maine will be buffeted by high winds, sleet and snowfall rates that could get as high as 2 to 4 inches an hour in certain parts of New England. MODERATE/ HEAVY SNOW on i95 in southern Maine about 30 miles south of Portland, ME. Wind guests up to 60 miles per hour are also expected along the mid-Atlantic corridor, from Washington, D.C., to New York City. Blizzard whiteout conditions are expected in New Hampshire and Maine. Airlines have taken note. Roughly 3,000 flights have already been canceled. "A low-pressure system tracking eastward across the Ohio Valley and Mid-Atlantic region was due for "rapid intensification" on Sunday night and Monday morning after it passes through the New England coast.
" 'It will become a powerful nor'easter with blizzard conditions expected for parts of Maine as the winds become quite strong,' the weather service said." Central and eastern Maine are set to get the worst of it, according to Accuweather, saying they lie in the "bulls-eye of heaviest snow." Luckily, many tweeters in the path of the storm are remaining calm about the "big baddie snowblob" coming right for them. But in case the rest of you in the U.S. happen to be feeling smug that the snow won't be plopping on your heads, take heed: It's set to snow Tuesday in Amarillo, Texas. If the snow can strike even there, it can strike just about anywhere.